The Free Family of Flap Door Fittings is the next significant step in the development of Häfele’s expertise. The expectation to set a new standard for flap fittings in the market, and to have those fittings meet Häfele’s typical level of quality could only be achieved by developing and manufacturing the product in-house. A new manufacturing facility, the latest machinery and the most modern standards are the cornerstones for reliable production. Experienced development engineers in the factory ensure continuously high quality. The goal is to connect the opening and closing of cabinets with a feeling of luxury and reliability. Engineered by Häfele. The entire Free Family of Flap Door Fittings are being showcased on the Häfele Stand at AWISA, Melbourne 2016. 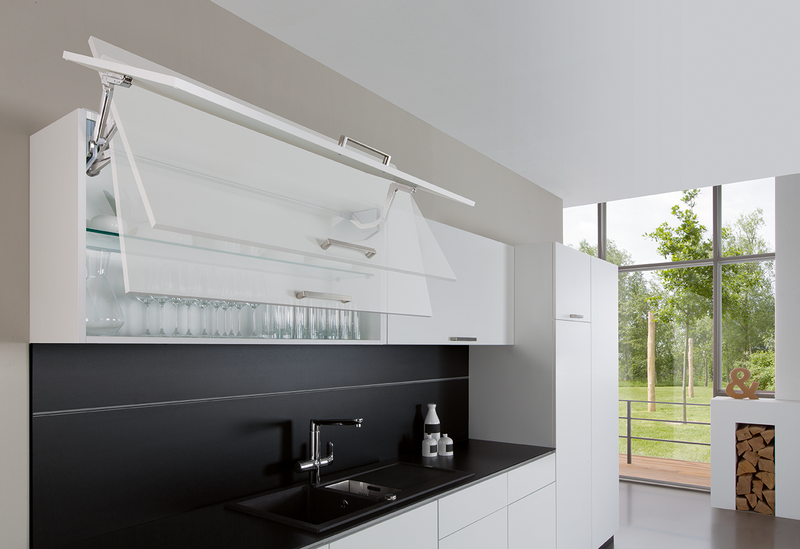 Free Flap, Free Up, Free Fold and Free Swing, Häfele cover all of the most popular types of openings for flaps on wall units. It doesn’t matter whether it is lifted, tilted, swivelled or folded – it immediately provides added value to any furniture item, not to mention more options in the visual and technical design of furniture. Häfele’s Free Family of Flap Door Fittings fulfil the highest of demands with regard to creative freedom and choice of material, design, ease of installation and convenient operation on a new level. To put it simply: They are slimmer (with regard to design), Lighter (to operate) and simpler (to install), all this without compromising on quality and value. Furthermore we can announce the soon to be released E-drive, the natural progression for a product family such as this and will be showcased for all to experience at AWISA 2016. All of the Free Family fittings can be optionally equipped with E-drive (electric drive). E-drive allows the flap to be effortlessly and effectively opened and closed all at the gentle tap on the front panel. Free Family with E-drive provides maximum convenience for both the user and the installer, and will no doubt be a showstopper in its own right.